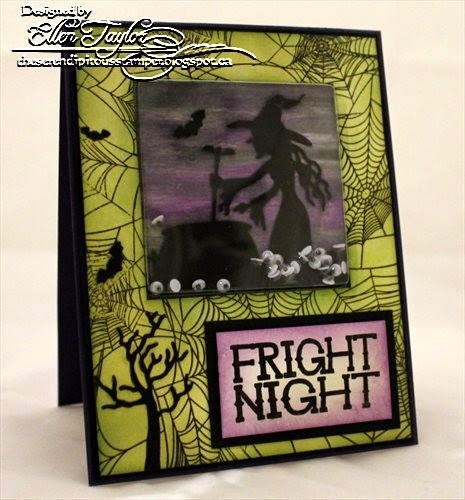 15 posts categorized "Shaker Cards"
We have a spooky and fun shaker card to share from Ellen Taylor today using Cover A Card Spider Web CC141, Creepy CL554, Witch Brewing DIE230-M, Halloween Hill Die029-P , Large Square Shake It Pouch SHP01and and Large Square Shaker Overlay SHC01. We have a fun shaker card to share today from Daniela Dobson. 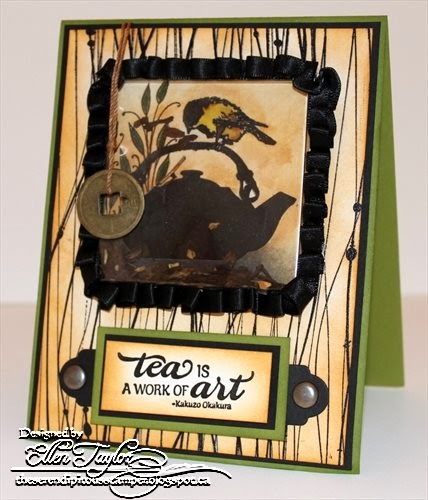 Daniela used G2202 Strawberry Trees, CL508 Basic Borders 2 , CC049 Screen, DIE123-P Banners & Tails, CL492 Warm Fuzzies Sentiments, DIE001-Z Shaker Frame Circle Die, Impressions Obsession Shake It Pouches and shaker overlays. Shaker cards are popular again. Have you seen Impressions Obsession Shake It Pouches? If you haven’t you need to go and take a look. We have different sizes and shapes, ready to be filled. They are self-adhesive. Just stamp your image, place your inclusions on top, peel the backing off and stick them down. Not only that, we have shaker overlays, pre cut to whatever shape you need for your card. I filled mine with sequins and beads. For the inside image I used an older stamp that I had called Strawberry Trees. I colored the strawberries with watercolor crayons. To cover the outside of my large shake it pouch, I used the Circle Shaker Frame Die. This die fits both sizes of circle pouches.I tied twine around the shaker.For the sentiment, I die cut the banner from Banners & Tails and stamped the sentiment from Warm Fuzzies Sentiments. I stamped some stripes at the bottom from Basic Borders 2 stamp set. It looks like washi tape. I stamped the white background with CAC Screen. Dina Kowal shares and adorable Fall shaker card today using Boy in Leaf Pile, Leaf Cluster die, Layered Floral set, and a large circle shaker pouch. I just felt like watercoloring for fun today, and found this neglected fall image (Impression Obsession's Boy in Leaf Pile). It seemed like a fun image for a shaker card, so I went in that direction. I started by stamping a few extra images at different angles to fill out the pile of leaves so it would cover the bottom of my large circle shaker pouch - I didn't worry about masking, and just let the leaves overlap, since I knew the watercoloring would cover up those less-defined areas. When I started watercoloring, I wet the entire area and just touched in different colored inks until I filled the space. I watercolored an extra portion of the paper too, so that I could diecut some matching leaves to fill my shaker. I used the Leaf Cluster die to cut the watercolored leaves, and the leaves from the Layered Floral set to cut some from solid cardstock... I ended up cutting the leaves off the clusters so they'd shake a little better. ..and some closeups of the details. I love the look of those tiny watercolored leaves - I miss fall! Ellen Taylor shares an adorable shaker card today! Surprise Cupcake, Sweet Treats CLEAR Set, Round Shaker. 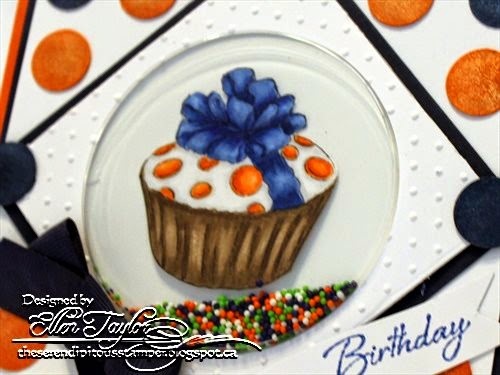 Daniela Dobson shares a super sweet pinwheel shaker card today using Party Pinwheels, Cover-a-Card Distressed Lines, , a large round shaker and Life Is Good. 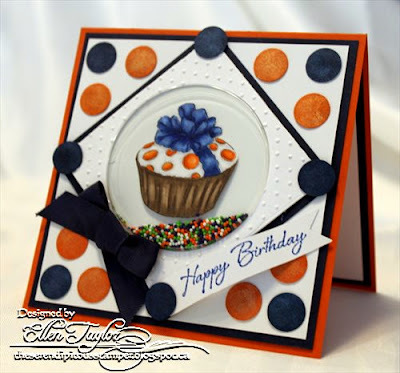 Laura Fulcher shares a beachy Shaker card today! Products used: Beach Chair F2337, Cover-a-Card Shells (CC122) & SHP08 Shaker Pouches - Lg. Rectangle. 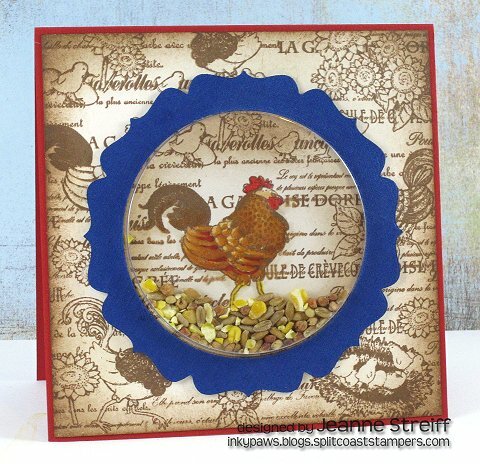 We have a Shaker Card from Jeanne Streiff today that uses real chicken scratch in her chicken themed card. When I saw our new dies I had to have the Snow Globe Die and couldn't wait to show you the fun I had with it! What really got me excited about the globe die is it fits perfectly with the Large Shake-It Pouch. I tried it out and below is what I did. First with Memento Summer Sky on white cardstock (background behind snow globe). Second and third time with VersaMark (Emboss Resist) on white cardstock, clear embossing powder, heat embossed, then brayered with Summer Sky (first well inked and the second much lighter for the snow globe). Cut white cardstock 5.25X5.25" for base, 5.0X5.0" of darker emboss resist cardstock, cut 4.5"X4.5" of blue snowflake on white background. Mounted the dark snowflake emboss resist on the white cardstock. Did the die cut for the Snow Globe from the lighter Emboss Resist and the base from some leftover Bazzill Dotted Swiss brown cardstock. Lined up the "globe" on the lighter Emboss Resist with the die cut and the die and traced around it. Die cut the hole for the Shake-It Pouch on the lighter Emboss Resist. Sm Deer - Spica At You Chocolate pen added to antlers and hooves. Fir Tree (smallest tree) - from green remnant cardstock. Sm Snowflake Set - used the two smallest with Sticky Paper and Glitter. One was used as "the Christmas star"and yellow glitter. the Snow Globe set - the label - from the Summer Sky snowflakes on white cardstock. The sentiment "Merry Christmas" is from clear set Sentiments II stamped with Momento Rich Cocoa. All but the label were mounted to the lighter Emboss Resist with Glossy Accents and a needle-nose applicator. Lined up the blue snowflake on white cardstock (with the hole cut out) and traced the circle where the pouch would be mounted. Mounted light emboss resist with your die cut images over the traced circle. Placed some beads, but Flower Soft, etc. can also be used inside. Removed the adhesive protector from around the Shake-It Pouch and placed it over the images and beads. Mounted the blue snowflake on white cardstock over the pouch, followed by the globe base. Mounted the sentiment, the bow, a little more glitter here and there and the heart stickers. Fun, fun, fun!! Thanks for stopping by to look and share. See you back here for DT Thursday. In the meantime, DT member, Jeanne Streiff will be posting on the blog too!! Welcome to the IO blog, Jeanne!! You will all love what she has planned for all of you!! Tuesday T&T Two Oceans Of Fun! I really liked dkdesigns images the minute I saw them. Today I am showing two techniques. The first one is basic layering using Dina's Sail Collage. The second one is a shaker using Dina's Beachcomber and Gary Robertson's Path To The Beach. For some reason, that is what I thought of the minute I saw that cute little guy. Stamped Sail Collage on dark brown cardstock inking just the edges (frame) with Brilliance Galaxy Gold. Used heat gun to set ink. Cut the center out and used the edge as a frame. Stamped the whole image again twice with white card stock using Brilliance Galaxy Gold again. Used heat gun to set ink. The second image is used as a map to follow for layering. Cut the compass, the boat, and the wave out. The ship was layered first with just tape. For the waves and I used 1/16" 3D pop dots. For the frame I used 1/8" 3D pop dots. For dimension on the waves I used Viva Decor Pearl Pen. It was turned over on the green Pergamano mat and embossed from the back with the stylus. A line of Glossy Accents was threaded around the edge and left to dry. It was turn over and the center was embossed with the stylus to make a place for the 5mm pearl sticker. The compass was attached with glue dot and the pearl sticker seated with Glossy Accents. Rolling Waves was stamped using Mega MountTM and Brilliance Moonlight White ink on light blue cardstock. I over inked in places to get a frothy look. It was trimmed to 4"X5.25" and then taped to the4.25"X5.5" dark brown cardstock. The twine in the photo was used with the Bow-Easy to make the bow (I actually pulled the twine apart and used one of them). The shells were mounted with glue dots. Thanks for stopping by to look and share. I stamped Beachcomber first, using Memento Desert Sand. Beachcomber was inked with Desert Stand and stamped. Then it was trimmed and the upper portion removed with an X-Acto knife (I wanted the Path to the Beach Image to show behind the little boy). A remnant piece of the same cardstock was used with the Circle Shaker Frame Die. That was placed on the card stock with removable tape as shown on the right (I used the little boy image to decide where to place the die cut. The little boy fits perfectly inside the die cut). I used the Mega MountTM and lined up Path To The Beach by the lines of the ocean. The image was inked with Memento Desert Sand and stamped on the Natural cardstock. First the background, the die cut and the little boy were painted. The little boy was permanently placed. The little pebble near his hands were highlighted with Rangers Stickles Diamonds glitter glue. The image was put through the Cuttlebug using Spellbinders Romantic largest Rectangles. I used the iridescent clear micro beads to put in the circle on the little boy. The strip was removed from the pouch and placed over the boy. Tape was applied to the die cut and it was placed over the pounch lining it up with the background. The sentiment, Prescious Treasure, was stamped using Memento Rich Cocoa. The cardfont was place on a 6"X8" folded to 4"X6" white piece of cardstock. A bow was created using May Arts two tone ribbon and the Bow-Easy and then mounted with a glue dot. Hope you enjoyed the cards. Each card has a separate list of supplies used below. Our next challenge is "Dies". Hope you join us. You must still use IO stamps with your dies. Thanks for stopping by to look and share. Shake, Rattle, And How Does It Go? 1. The image, Pumpkin Patch - C2271, was stamped on Neenah Classic Crest Natural cardstock with VeraFine Onyx Black ink. It was painted with Twinkling H2O's Orange Peel, Olive Vine, Sweet Alfalfa, and Yellow Rose. An art brush was used to "spike" the grass. Stickles Yellow glitter glue was used to highlight the eyes and mouth of the pumpkin. 2. The largest die from Splellbinders Large Scalloped Ovals was used with Bazzill Swiss Dots cardstock. The die cut was then embossed. The next to largest oval from Spellbinders Large Ovals was used to cut out the center of the scalloped die cut. 3. Treasure Beads Blazing Orange bead mix was placed in the center of the painted image. The Oval Shake-It Pouch™ was used next. There is a lining around the outer edge of the oval. (I saved the lining to use on another card.) That was removed exposing the adhesive underneath. It was centered over the image and put down as shown. Then the scalloped embossed die cut was mounted over that as shown. 4. The center portion of the die cut was used to make the die cut frame for the word as shown. The "Hi!" is from Clear Stamp Set Anytime Sentiments - CL43. It was stamped with the VersaFine Onyx Black ink on Neenah Classic Crest Natural cardstock and the dots in the word were highlighted with Stickles Yellow glitter glue. 5. Cover-a-Card™ Leaves - CC019 was inked with Adirondack Pesto ink and stamped on Neenah Classic Crest cardstock using the Acrylic Mega Mount™. (It is so fast and easy to do background stamps. I have yet to get a poor image using mine. I set it on its handle to ink it and clean it. Talk about easy!!). I also inked just a portion of it so I could do the lower left hand corner of my envelope. 6. A 4.25"X5.5" piece of the Swiss Dot cardstock for the Background edge. A 4.0"X5.25" piece of Neenah Classic Crest Natural cardstock was mounted next, followed by a 3.75"X5.0" piece of the Leaves cardstock. A piece of the left over Leaves was also used for the inside top portion of the card. 7. The main image was mounted with 3D pop dots. The May Arts ribbon was mounted as shown. It was crossed over just below the image. The words were mounted between the image and the corner of the card. The bow was made with the Bow-Easy and mounted with Glue Dots. Some of the Leaves were painted with just a wash of Orange Peel watercolor as shown. 8. Mark Richards Yellow 5 and 2mm rhinestone stickers were mounted at top left-hand corner, over the knot of the bow, and lower right-hand corner as shown. Paper: Neenah Classic Crest Natural Super Smooth cardstock, Bazzill Swiss Dots. Accessories: Spellbinders Large Scalloped Ovals and Large Ovals, Organdy Ribbon, Oval Shake-It Pouch™, Bow- Easy, Stickles Yellow glitter glue, Mark Richards 5MM and 2MM Yellow Crystal stickers, Orange May Arts ribbon. A fun card. It looks like lots of steps, but it was fast. The shaker was a snap. I am off to do another one, it was so much fun! Thanks for stopping by to look and share!! The NEW PRODUCTS AND STAMPS are all listed in the online store. Happy looking. Let me know what you think. As some of you might know or remember, I am currently working on updating all of the Photo Albums here. You can go to them now and see most of the new cards designed by the DT. I am still proofing for cut and paste errors, and adding them to Card Types (Christmas, Halloween, etc.) and Image Designers (Leigh Hannan, Gary Robertson, etc). :-) Thank goodness for spell check. Now if they just had a cut and paste check. LOL The next part is narrowing down the albums so they aren't so confusing. I would stick to the DT's albums at the top for now if I were you. I will see you back her tomorrow for the Fall Challenge. Don't forget to use IO stamps. Thanks for stopping by to say hi! The online store should be updated with the new stamps and products by at least Tuesday, if not sooner. I will post here as soon as it is ready. I am currently updating all of the albums. When that is done I will also post here and on my other blog too....So stay tuned people..... Thanks for stopping by the blog to look.